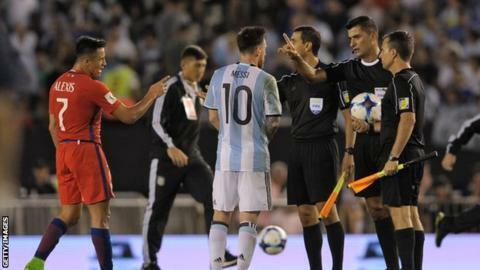 Lionel Messi was banned for four international matches - just five and a half hours before Argentina's World Cup qualifier against Bolivia kicked off. The Barcelona forward was punished for directing "insulting words" at an assistant referee during Thursday's 1-0 win over Chile. Messi, who scored the only goal in the qualifier, was angered when he was penalised for a foul, waving and shouting at the assistant in response. The 29-year-old was fined £8,100. He will miss his country's next four competitive fixtures. Argentina are third in South American qualifying, with the top four teams advancing to next summer's finals in Russia. There are five matches still to play.